I post these for no other reason than that they are just breathtaking. I've seen these two lovely aircraft up close, but it's another thing entirely to see them in the sky. 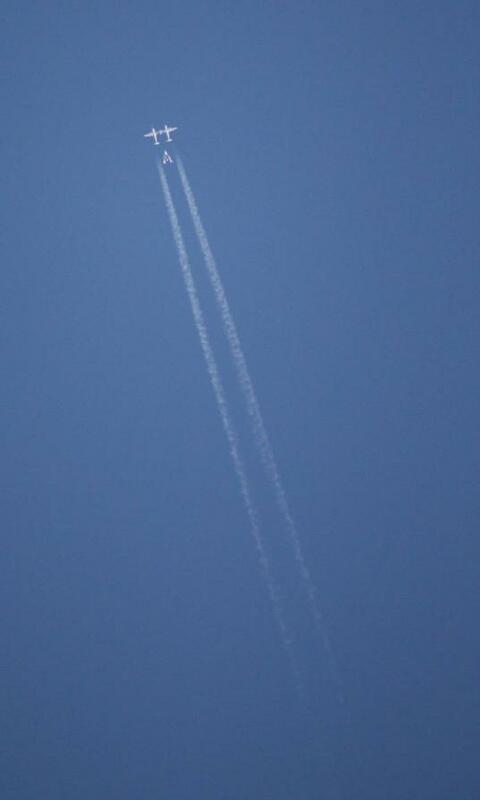 Especially to see SpaceShipTwo gliding free of WhiteKnightTwo. 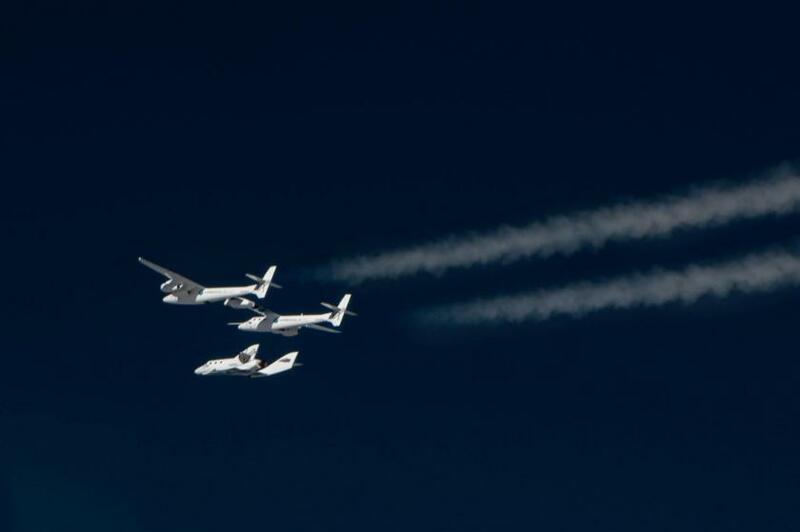 The pictures were taken during a test flight on April 3; Virgin Galactic shared them on their Facebook page yesterday. 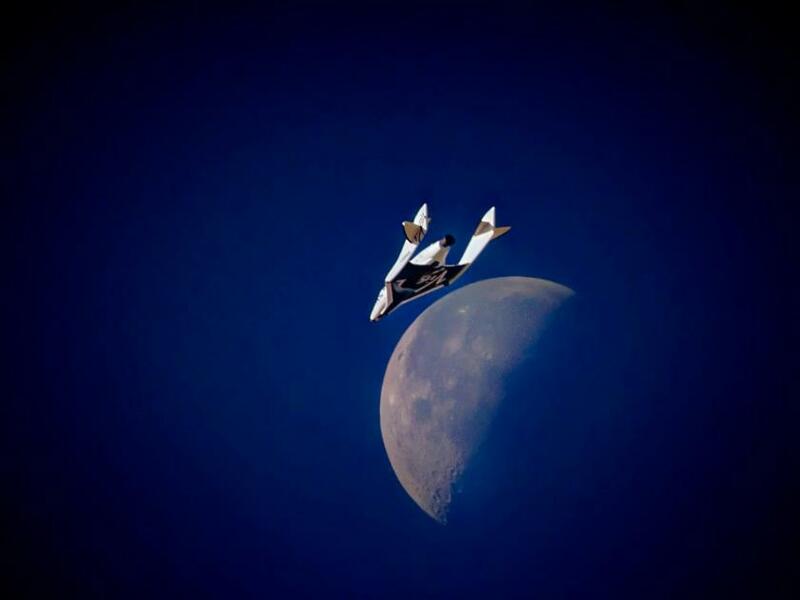 SpaceShipTwo has still not been tested in powered flight. SpaceShipTwo glided past the Moon as she came in to land at the Mojave Spaceport after another successful test flight. This was her 24th glide flight and the 6th in-flight test of her patented feathered re-entry system. The flight also successfully verified SS2's nitrous loading and venting system, another key milestone on the way to her first powered flight. I s this simply just another step towards a larger version in the future of both crafts? Mike Martinez - WhiteKnight Two (aka "VMS Eve" for Virgin MotherShip) and SpaceShip Two (aka "VSS Enterprise") already *are* the scaled-up versions of WhiteKnight One and SpaceShip One. Emily, these are great pictures, thanks for sharing them. This is the full size craft, designed to take five people (I think) into space. I hope Virgin, or someone takes the next step and offers affordable rides into orbit. David Gash - Try $200,000. When do we get warp drive?